Submitted by Depot Kite on Thu, 2008-03-06 09:44. Submitted by Depot Kite on Thu, 2008-02-21 20:02. Have you ever dreamed about doing more with a PDF file than simply view static text? Well now your dreams can come true, and you can dazzle your audience. As some of you know, you can add hypertext links inside a PDF file, however, you can actually be even more creative by inserting 3D images and movie clips. This article describes and demonstrates how you can embed SWF (movie) files, created in Adobe Captivate into a PDF file. You will also learn how to provide a poster image that readers can use to activate the movie clip. Submitted by Depot Kite on Thu, 2008-02-21 08:50. A section dedicated to videos on the web that is intended for webmasters. Web designers and developers once faced several hurdles getting video onto the web: data-intensive video files that downloaded slowly over low-bandwidth connections, and users having to install special players to view video in pop-up windows. Most people now access the web using high-bandwidth connections, and web designers and developers are standardizing on the Flash video (FLV) format. Video plays directly in the page through Adobe Flash Player, without requiring additional plug-ins. Whether you're planning your video shoot, encoding video, or delivering it to your audience, start out with the Flash Video Learning Guide. Then check out the samples and tutorials in the Video Topics areas. Submitted by admin on Wed, 2008-02-20 16:18. Our next AMMUG meeting is planned for Thursday, February 21, 2008 @ 10:00AM in Extension Hall Rm. 67 (CTU Conf.). The spring semester Adobe Certification Study Group will meet Tuesdays & Thursdays @ 5:00PM in Extension Hall Rm. 67 (CTU Conf.). See you there! Troy Hahn will be discussing the use of Google's Webmaster Tools and an overview of how you can start using Connect! Submitted by admin on Wed, 2008-02-13 18:03. Enter the most prestigious competition for creativity in illustration, the 49th annual Communication Arts Illustration Competition. Any illustration first printed or produced between March 14, 2007 and March 11, 2008 is eligible. Selected by a nationally representative jury of distinguished designers, art directors and illustrators, the winning entries will be published in the July 2008 Illustration Annual. Over 70,000 copies of the Illustration Annual will be distributed worldwide, assuring important exposure to the creators of this outstanding work. As a service to art directors, designers and art buyers, a comprehensive index will include addresses, email and telephone numbers of the illustrators represented. Submitted by admin on Wed, 2008-02-13 17:52. Attendees will be entered to win Adobe Creative Suite 3 Design Premium, but you must be present to win. All attendees will receive a FREE CS3 Video Workshop CD. Submitted by hartljo on Tue, 2008-02-12 16:26. If your users are already using Contribute to update websites and/or blogs, this is one more thing they can do through the same simple interface. This consistent, familiar working environment and tool set makes it easier for them to be productive across these multiple platforms. Even if they are not currently using Contribute, they may want to start in order to take advantage of the easy to use interface, built in image editing, spell check, PDF creation even without Acrobat, etc. Submitted by admin on Mon, 2008-01-28 10:30. You may be interested in a FREE InDesign and Photoshop seminar being offered by EBSCO Media on February 14th at the McWane Center in Birmingham. 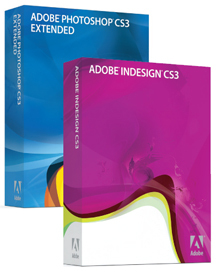 Attendees will be entered to win a FREE copy of Adobe CS3, but you must be present to win. Free parking in the parking deck, adjacent to the facility on 2nd Ave. N. (between 18th Street and 19th Street). Park on level C and enter through the Special Events Entrance. Submitted by Depot Kite on Fri, 2007-11-30 16:05. If anyone is intrested in joining me to study you are welcome too. Perhaps we can setup some times to do this. My goal is to take a minimum of 2 by the end of January.